New Delhi: Finance Minister Arun Jaitley will present the current NDA government's fifth and arguably his toughest Budget yet as he seeks to address agriculture distress, create jobs and boost growth while at the same time stick to fiscal prudence.The Budget, in view of upcoming assembly polls in eight states - including three major states ruled by the BJP - and general elections next year, may see new rural schemes and stepping up of funding towards existing programmes like MNREGA, rural housing, irrigation projects and crop insurance. With the recent elections in Gujarat indicating erosion of BJP's rural vote base, Jaitley may also unveil incentives for the farm sector. 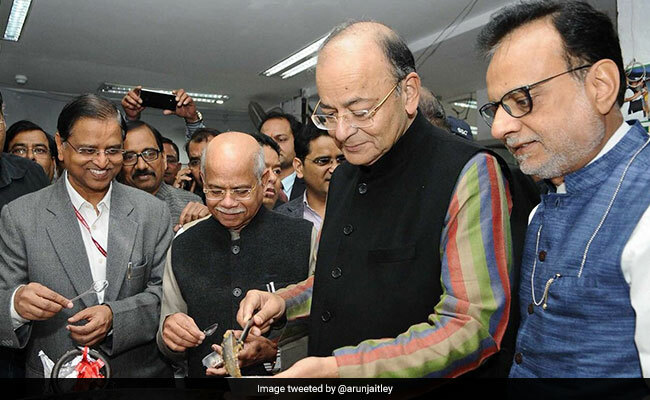 Small businesses, which have traditionally formed the core support base of the BJP, too may get some sops to ease pain caused to them due to chaotic rollout of the Goods and Services Tax (GST) and demonetisation. There is also an expectation that common man may get some relief in income tax by way of a raise in the exemption limit.Also on Jaitley's menu may be upping spending on infrastructure projects like highways and modernisation of railways to boost economic growth that is at a four-year low. But he has to do all this while sticking to the road map of narrowing one of Asia's largest budget deficits, as failing which, India may fall on the wrong side of global investors and credit rating agencies which had late last year handed out a rare sovereign upgrade. The target Jaitley had previously set out was to lower the fiscal deficit to 3.2 per cent of the GDP in the current fiscal and to 3 per cent in 2018-19, the Budget for which he would present in the Lok Sabha today. Prime Minister Narendra Modi seemed to have already lowered expectations of mass voter swaying announcements when he indicated that the Budget may not be resort to populism and that it was a myth that common man wants sops.This will be India's first post-GST and is being keenly watched to see what Jaitley does to boost growth in Asia's third largest economy. There are talks that tax break on capital gains from stock investments may go and it remains to be seen if Jaitley will finally show some movement on his 2015 promise to lower corporate tax rate to 25 per cent from 30 per cent over four years.He has to manoeuvre all this within limited scope of tinkering with tax rates given that central excise duty, which was levied on goods manufactured in the country, and service tax have both been subsumed in the GST and he no longer has the sole power to fix rates on them. Also constraining him would be the rise in global oil prices, which can stoke inflation as well as widen current account deficit.Some kind of incentives to boost exports of certain sectors may be announced while there may be announcements for start-ups as well as for promoting entrepreneurship. There have been mixed signals on deficit target, with Chief Economic Adviser Arvind Subramanian earlier this week stating that a pause in the fiscal consolidation plan can't be ruled out while NITI Aayog vice chairman Rajiv Kumar saying the government is likely to stick to the target. In the first eight months of 2017-18, fiscal deficit reached 112 per cent of the target, stoking fears of a fiscal slippage. The shortfall was largely due to reduced dividends from government companies, which the government looks to bridge through stake sale in state-owned firms like HPCL. Scrapping the colonial-era tradition of presenting the Budget at the end of February, Jaitley had for the first time presented the annual accounts on February 1 last year. The Budget presentation was advanced by a month to ensure that proposals take effect from April 1, the beginning of the new financial year. Also, the nearly century old tradition of having a separate budget for the railways was scrapped and merged with the general budget. The Union Budget 2018-19 would be the last full Budget of the BJP-led NDA government before the 2019 general elections. As per the practice, a vote-on-account or approval for essential government spending for a limited period is taken in the election year and a full-fledged budget presented by the new government. While P Chidambaram had presented the previous UPA government's vote-on-account in February 2014, Jaitley had presented a full budget in July that year. The Budget for 2018-19 will be the first budget post implementation of the GST regime. Even though independent India's biggest tax reform of GST was implemented from July 1, the Budget for 2017-18 (April- March), had followed the practice of tax revenue projections under the heads of customs duty, central excise and service tax alongside direct tax numbers. With excise duty and service tax being subsumed in the GST, the classifications in the forthcoming budget may undergo change. While a new classification for revenues to be accrued from GST will be included in the Budget for the next fiscal, for the current year two sets of accounting may be presented one for actual accruals during April-June for excise, customs and service tax, and the other for July-March period for GST and customs duty.